The Clockapult of Time is a Shadow type weapon. As a golden platform accelerates near 88 miles per hour, the hands of this spooky-looking clock begin to spin with incredible speed. With a faint flash of purple light, the mouse is sent far into the future. To an outside observer, the trap appears to trigger in the blink of an eye, but to a mouse caught within the event, the journey seems much, much longer. The clock begins to blur as the hands spin faster and faster. The clock face glows eerily as everything that was once the present blends to what was once the future. The Clockapult of Time can be purchased for 2,700,000 gold from the Trapsmith in Cape Clawed. It refunds for 486,000 gold at the same location. The Clockapult of Time (if unintentionally smashed) can be reassembled from Clock Parts. Clockapult of Winter Past – An unremovable-skinned version of the Clockapult of Time with identical stats. 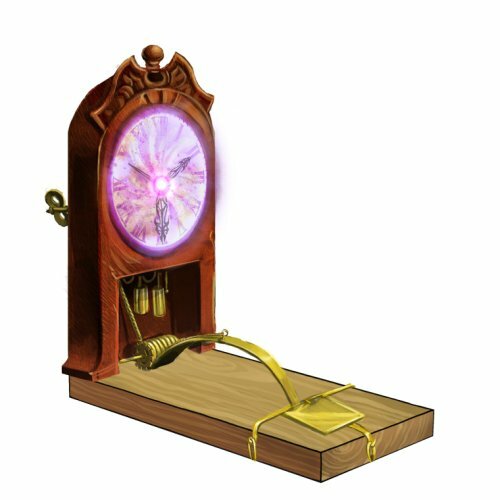 Clockwork Portal Trap – Requires Clock Parts from the Clockapult of Time to be crafted. A complete list of Shadow weapons can be found here. Smashing this weapon with the Hunter's Hammer yields Clock Parts. 11 August 2009: The Clockapult of Time was released with the introduction of the Jungle of Dread. The "nearly 88 miles per hour" and the "clock tower" portions of the description are references to the Back to the Future! movie series. 29 July, 2015: The point requirement for the Clockapult of Time was lowered from 20,000,000 to 12,500,000. This page was last edited on 21 February 2019, at 16:37.